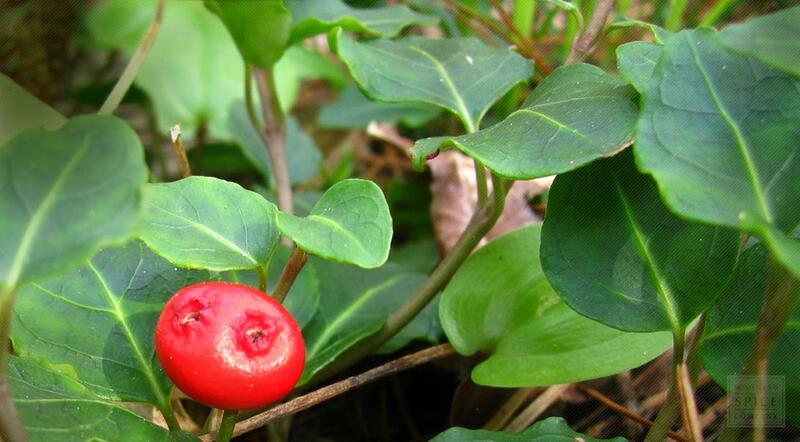 Squawvine, also known as squaw bush, winter clover, running fox and partridge berry, is a spreading, evergreen shrub in the madder family that occurs naturally in Japan and North America. 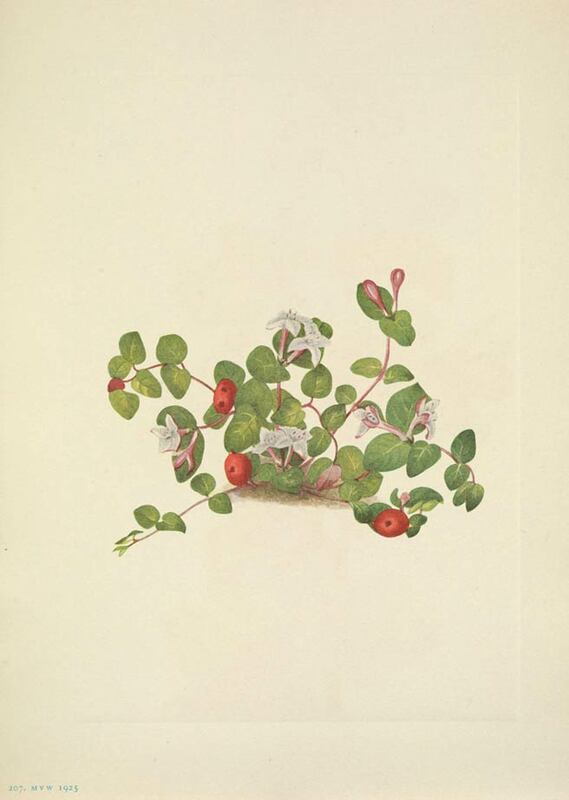 As some of the common names for this plant suggest, it has a history of use by women and serves as winter forage for various birds and animals. Because the herb has a strong, astringent taste somewhat similar to wintergreen, its flavor is often toned down pairing it with other herbs in tea blends and tonics. Squawvine, as it is commonly called, is a non-climbing vine, growing no taller than 6 cm in height, with creeping stems from 15 to 30 cm long. The dark green, shiny leaves are ovate to cordate in shape and evergreen (meaning they retain green leaves throughout the year). The leaf's midrib is a pale yellow color. Its petioles are short, and the leaves are paired oppositely on the stems. Adventitious (accidentally formed) roots may grow at the nodes and rooting stems may branch and root repeatedly, which will produce loose spreading mats. Squawvine flowers are small, trumpet-shaped, and axillary. They are produced in pairs, with each flower pair arising from one common calyx. The calyx is covered with fine hairs. Each flower has four white petals, one pistil, and four stamens. Squawvine plants have either flowers with long pistils and short stamens (long-styled flowers, called the pin), or have short pistils and long stamens (short-styled flowers, called the thrum). These two style morphs are genetically determined, and therefore the pollen from one morph will not fertilize the other morph, resulting in a form of heteromorphic self-incompatibility. The ovaries of the twin flowers fuse, so for each berry there are two flowers; the vestiges of this process showing as the two bright red spots on each berry. The fruit ripens between July and October, and may persist through the winter. The fruit is a drupe containing up to eight seeds; and these Squawvine fruits are never abundant. The plant's species name is the Latin adjective repens which means "creeping". Mitchella repens occurs in North America and Japan, more specifically it is dispersed throughout eastern North America, from south Eastern Canada south to Florida and Texas, and to Guatemala. Squawvine is found growing in dry or moist woods. It is also found along stream banks and on sandy slopes in part shade or shade. Squawvine requires a moist but well-drained lime-free soil. Seeds germinate better if given 3 months cold stratification. Therefore seeds are best sown in the autumn as soon as they are ripe. Be sure to remove all the fruit pulp from the seed as the fruit pulp contains germination inhibitors. When they are large enough to handle, transplant the seedlings out into individual pots and grow them on in the greenhouse for at least their first winter. Plant them out into their permanent positions in late spring or early summer . The leaves are harvested in the summer and dried for later use. Store dried squawvine leaves and squawvine powder in an airtight container in a cool, dry place.